His ship Endurance left Plymouth on 8th August 1914. 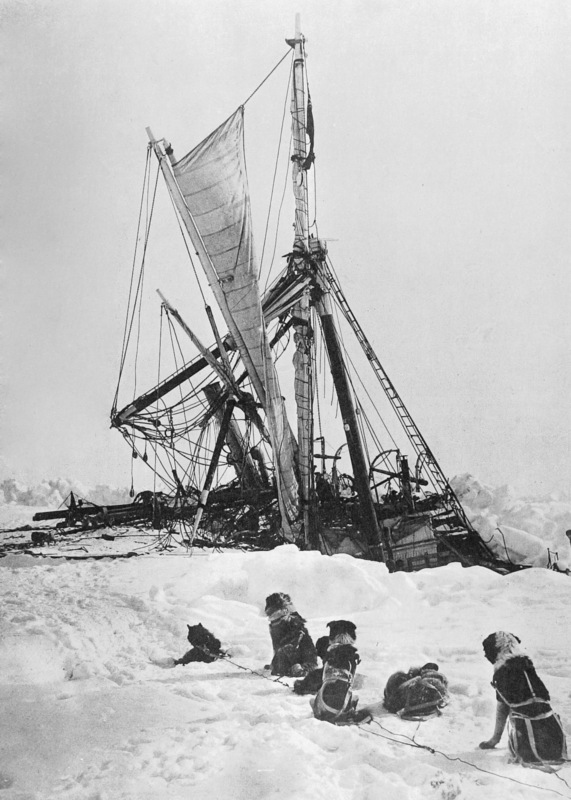 Soon after arriving in the Weddell Sea however, on 18th January 1915, she became stuck in the ice. Efforts were made to release her - on 14th February 1915 Shackleton ordered men on to the ice with: ice-chisels, saws and picks but this was useless. She drifted for many months until eventually began being crushed by the ice. The order to abandon ship was given on 27th October 1915 in freezing temperatures below -25oC and Endurance finally sank on 21st November 1915. The crew were now stranded in Antarctica and their task was simply to survive. They had to make new shoes out of pieces of wood scavenged from the ship and were forced to eat: seal and penguin meat, seal-bone soup, limpets and seaweed as their food supplies ran low. The men attempted to march across the slowly moving ice floe but progress was so slow that they decided to make camp and hope that they would drift towards safety. The ice rocked so much that many of the men became seasick. On 8th April 1916 the ice suddenly split and the men were forced to get in the small lifeboats they had salvaged from the Endurance. Shakleton managed to keep his men together by strong leadership and after a terrible journey with regular soakings in icy seawater, they reached the remote, uninhabited Elephant Island on 14th May 1916. From here, Shakleton then set off again with five of his men in a small, 7-metre lifeboat across savage seas with hurricane-force winds to reach the island of South Georgia on 10th May 1916. Once there, he then: marched over a mountain that had never before been climbed, found help and went on to rescue every one of his men left on Elephant Island on 30th August 1916. These men hadn't had any contact with civilisation for about two years and were unaware of the course of the Great War. News of the expedition's safe arrival in the Falkland Islands briefly eclipsed war news in the British newspapers at one point and many of the men involved were given the Polar Medal. On their return however, most had to immediately take up active military or naval service.